The Horror Movie BBQ: My Love Of Being A Halloween Fatty! Halloween season is now in full effect. Sure, September helped kick it off. But today is October 1st...it's crunch time, people. Preparing for Halloween is always fun for me. I'm a firm believer in having fun in everything you do in life, so Halloween is no different. I've always loved Halloween. It's just a fun feeling, especially as a horror movie fan and those young at heart. it's fun to be able o let your freak flag fly, dress up and indulge in the fun of the season. And lets face it, who doesn't love free candy! 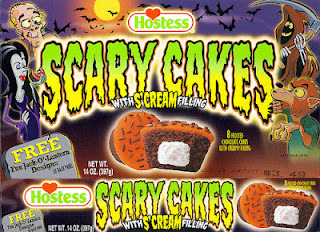 I give you the Hostess SCARY CAKES! Yes! 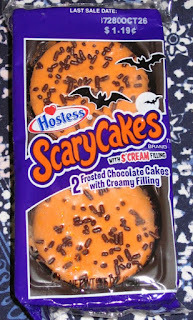 These simple little orange frosted cupcakes ring in every Halloween season for me. 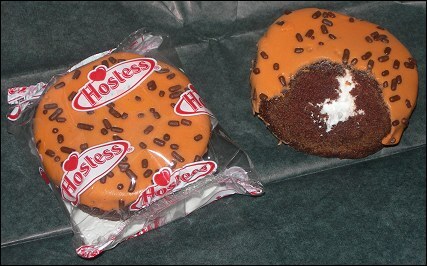 Usually accompanied by a similarly orange-adorned SnoBalls, called GloBalls, these come out every Halloween season as a special treat for the spookiest time of year. 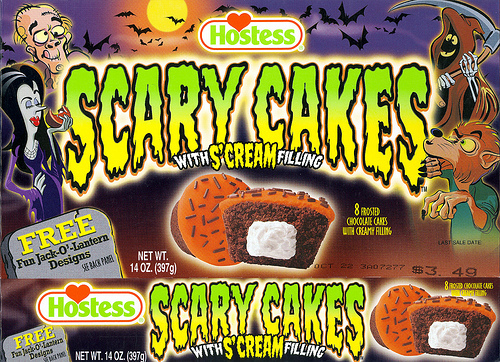 It's selling point was usually the packaging featuring a generic Halloween scene and it's "S'Cream Filling". A selling point no other cupcake can offer. 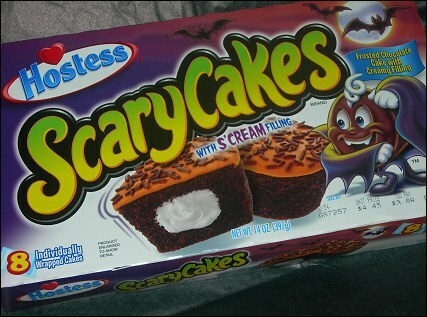 I first fell in love with these when I began working in the public schools in 2003. It seemed every other night, I was picking these up after I discovered an article on my all time favorite site, X-Entertainment. 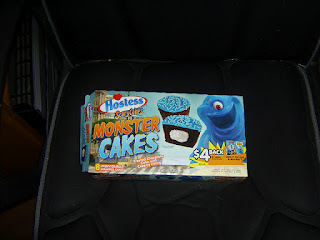 I found the fact that the cupcakes were specially made out to celebrate my favorite holiday very enticing. 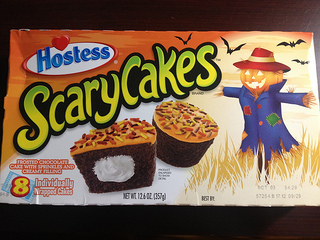 After that year and every year following, I always waited with anticipation for my favorite treat. And whenever I saw them, my heart would skip a beat. They just look so much fun and taste delicious. A few years back though, it seemed as if the orange and black design was ignored in favor for promotions surrounding DC Comics and the movie "Monsters and Aliens". But after a few years of sitting on the bench, the classic look is back. 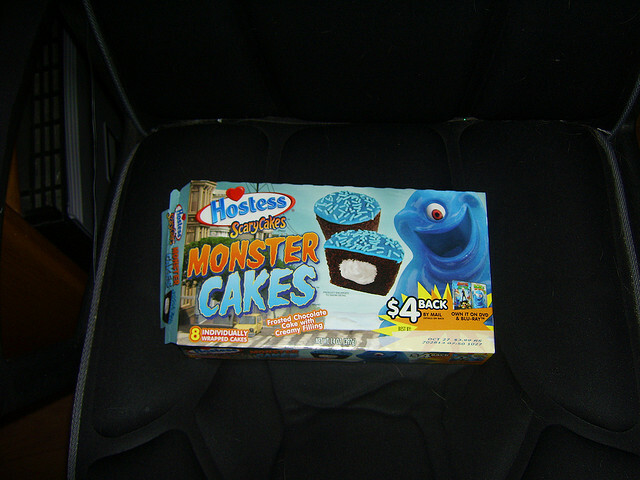 Here's some pics of packaging and the varieties they've come to us throughout the years. 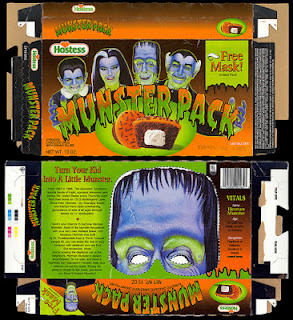 On a personal note, my favorite is The Munsters packaging. As a lover of all things Munsters and Hostess cupcakes, why wouldn't it be!